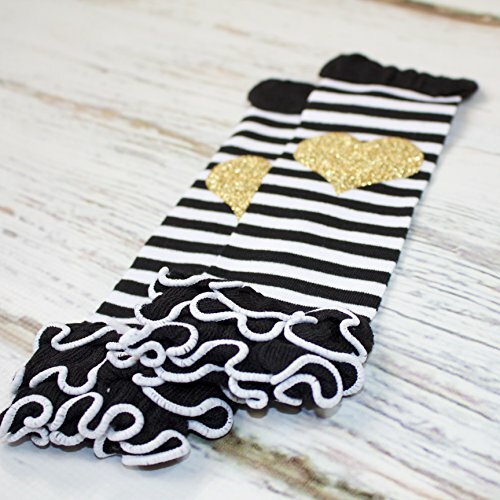 These black and white striped ruffle leg warmer with single glitter hearts on them are too cute! 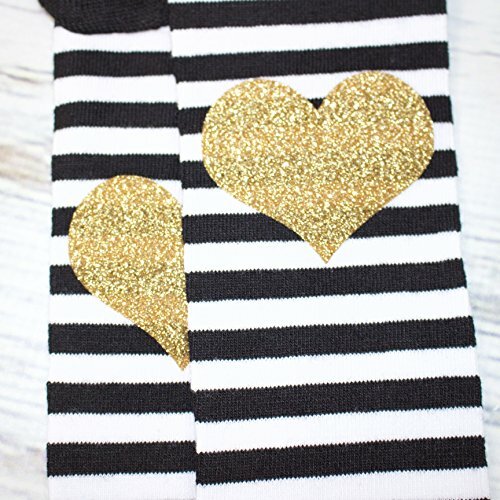 Pair them with our matching glitter gold tops for the absolute cutest possible combo. GREAT FOR 3 MONTHS TO 2 YEARS - 9-12" in total length and are PERFECT for 1st birthday or 2nd birthday pics. Brand newborn can fit but may be a bit loose. TODDLERS TOO - 3,4 & 5 year olds look adorable in these as well. They will fit on the calf and sometimes up to the knee. Turn then upside down and use them with boots too! HIGH QUALITY - Pair them with our adorable bodysuit and shirts to make your moment even more special. If you have any questions about this product by Olive Loves Apple, contact us by completing and submitting the form below. If you are looking for a specif part number, please include it with your message.